As a CEO I developed a daily habit. Every morning before work, I walked for two miles through Central Park. My initial motivation was physical fitness, but I soon made a transformative discovery: During these walks, breakthrough ideas would come to me totally unbidden. Often, I found a solution to a knotty problem that had defied my attempts to produce a good answer through rational analysis or intensive discussions with colleagues. What was going on here? At first, I thought this experience was idiosyncratic — an individual quirk. But the science tells a different story. Aerobic exercise such as walking improves our cognitive function by releasing two chemicals: A protein called BDNF that nourishes and energizes our neurons, and hormones known as endorphins that produce a sense of calm and well-being. The combination of these chemical actions enables us to think in deeper, more imaginative ways. This is true for everyone. A Stanford study released in 2014 found that walking increased a person’s “creative output” by an average of 60 percent. Steve Jobs of Apple was known for conducting walking meetings, which are increasingly popular among employers, highlighted by a recent front page article of the Wall Street Journal that quoted an executive gushing how “ideas started to come to life” during a walk-and-talk through Bryant Park in midtown Manhattan. Nikola Tesla gave birth to the idea of the rotating magnetic field that enabled broad scale electrification during a walk in a Budapest park in 1882. Friedrich Nietzsche, the 19th century philosopher, produced his most profound thoughts during long Alpine walks. “All truly great thoughts are conceived while walking,” he claimed. 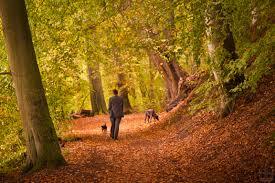 Ludwig van Beethoven, the renowned composer, took long walks in the afternoons, regardless of the weather. He carried a pen and sheets of paper where he recorded his many inspirations during these outings. Werner Heisenberg, who discovered the foundations of quantum physics, achieved the breakthrough in his thinking during a two-week absence from the University of Göttingen to recover from an illness. He traveled alone to a remote archipelago on the North Sea and was doing nothing but taking daily walks and going for long swims when the bewildering intricacies of quantum theory formed clearly in his mind. Today’s dynamic business environment presents us with a toxic mixture of speed and complexity. It is becoming nearly impossible with traditional thinking tools to make sense of these confusing conditions. We are being forced into shaping the future of our organizations on the run. We call hasty meetings, glance quickly at position papers, sit through dense PowerPoint presentations, and are then expected to make immediate decisions. I often hear the disturbing comment from executives that, “We don’t have time to do a strategy.” The challenge is clear: We must learn better cognitive skills to cope in real time with a disruptive landscape, in circumstances where we will never have perfect information. There are essentially two modes of thinking: breaking an issue down into its component pieces (analysis) or seeing how the pieces fit together (synthesis). Research shows that strong analytical skills are common among executives, whereas the ability to synthesize is very rare. This presents a problem. Many major advancements in the history of knowledge, such as Einstein’s theory of relativity and Darwin’s insights on evolution, have been acts of synthesis rather than analysis. They involve seeing connections that had previously not been understood. While analysis deepens understanding, synthesis is a pathway to wisdom. By now, it should be no surprise to hear that Charles Darwin took regular walks. Einstein, while he was was grappling with the intricacies of his general theory, induced his mind to wander by playing Mozart on his violin. As illustrated in the above examples, to walk is to think, and do so in different, more creative ways. In short, it helps us make sense out of chaos— a crucial role of strategic thinking. As the famous military strategist Carl von Clausewitz declared: What matters most is not what we have thought, but how we have thought it. I have found on my walks that most of my insights were acts of synthesis rather than analysis — perceiving patterns and finding meaning in the relationship between things. 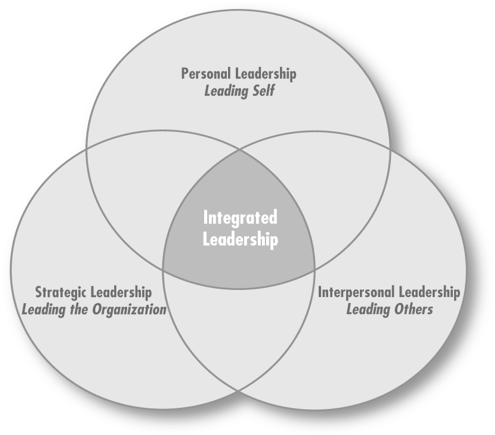 It was on one of my walks that I first discerned the idea of holistic leadership that unifies strategic leadership, personal leadership, and interpersonal leadership as depicted in the figure below. I began to see how these three domains are mutually supportive, like an ecosystem, and that if one aspect is deficient, it undermines the other two. This theory of integrated leadership has since found its way into my teaching. Would I have connected these dots while sitting at my desk? Maybe in rough outline at best, but it was the process of walking that sharpened and deepened my thinking. Two classical images sum up the contrasts in thinking methods. 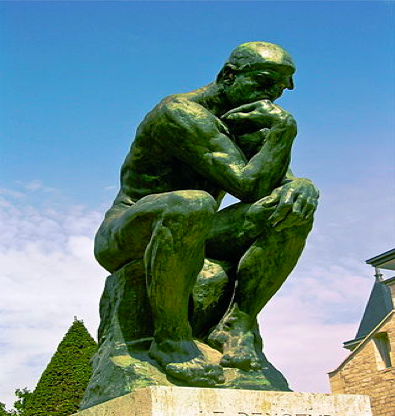 The first is Rodin’s “The Thinker.” It is an exquisite depiction of the male form in contemplation but sends absolutely the wrong message. A static posture is not the best way to develop creative ideas. 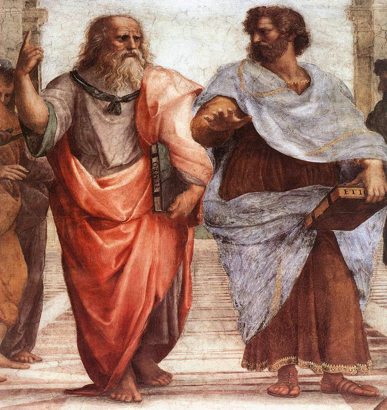 The second image shows Plato and Aristotle walking and reasoning together. This captures Aristotle’s unique practice of teaching while walking about. His followers became known as the peripatetics — Greek for strolling around. Aristotle’s powerful example has come full circle. Modern times have created daunting challenges of thinking clearly in chaotic conditions while being assailed by constant distractions. Winning strategies depend on our ability to see through the fog of complexity and develop the keenest insights. We must sharpen our thinking tools. A simple and effective method is within our grasp. Become a peripatetic. In today’s parlance, take a hike. Finally, a confession, and you probably guessed it: The idea for this story came to me during a morning walk. – Walk as a daily habit. Mornings are best. – Venture outdoors (weather permitting) so you are exposed to the wider world. – Turn off your cell phone. – Ideally, walk for 20 to 30 minutes. Also take brief walks between intense mental tasks. – Free up your mind. Ideas will come to you. – Write down your insights and keep a learning journal. As a CEO for 20 years and a professor of strategy for over 20 years now, my mind turned to this question: among the constant stream of business prescriptions over time, what are the most powerful ideas I have come across – those that have made the biggest difference in practice? My reflections produced answers that surprised me: none of the best ideas is new. Indeed, some are centuries old. But more than any others, they have deepened our understanding of how to thrive in today’s dynamic world. Our only sustainable competitive advantage is our ability to learn faster than our competitors. In his 1997 article, “The Living Company” Arie de Geuss asserted that sustainable competitive advantage cannot be achieved through particular products or strategies. These are soon overtaken by fast-moving events. Instead, he argued, an organization’s survival depends on its ability to build an adaptive enterprise – one that constantly learns and renews its strategies as the environment changes. Organizational learning, however, does not happen by itself. It must be ignited, sustained and directed through a deliberate company-wide process. There is no greater leadership responsibility than this. To contend with today’s dynamic world, this must be a dynamic process – a learning cycle that guides organizations continuously from the discovery of fresh insights to the implementation of innovative actions. This requires an essential shift of gear from strategy as planning to strategy as learning. Consider the US military’s technique of action-learning. After every engagement it applies its famed “After Action Review” to examine what worked and what didn’t, to ensure that every subsequent engagement will be an improvement over the prior one. This makes a huge difference to its prospects of winning. As a young brand manager at Unilever, I became fixated on emphasizing the distinctive product attributes of my brand and presented my strategy to my boss accordingly. He gave me a chilly reception. “Your thinking is back to front,” he said. “Customers don’t buy attributes. They are looking for solutions to their needs. You must learn to think outside-in, not inside-out.” With that, he handed me Theodore Levitt’s 1960 masterpiece, “Marketing Myopia.” Levitt’s ideas have influenced my thinking ever since. Levitt’s underlying idea is that companies don’t sell products. They sell benefits. 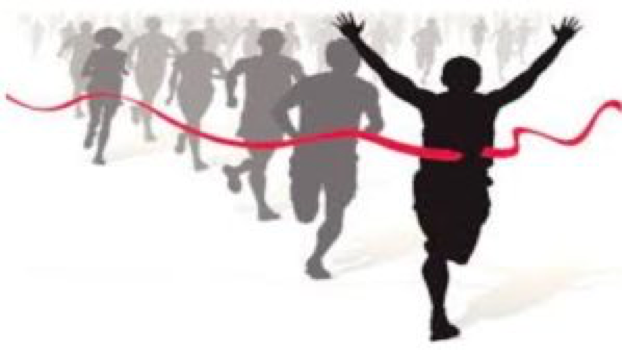 Competition expresses itself through the provision of benefits that transcend the product itself. Take Hallmark Cards’ statement of purpose: “We help people connect with one another and give voice to their feelings.” The cards themselves are simply a vehicle. Human connection is the value they provide. This means there is no such thing as a commodity. There are human beings at either end of any transaction and the service model – the way the transaction is conducted – is the key benefit. Strategy is plagued by greater confusion than any other business discipline. Ask five companies to explain their strategy and you will get five very different notions of what a strategy looks like. Strategy was born in the military, then co-opted by business. Businesses, however, court failure by neglecting to apply the key concepts of this essential leadership domain. 1) Strategy is a process of making choices on where to compete, what to offer, and how to differentiate your business by creating greater value for customers than competing alternatives. 2) Such choice-making requires balancing trade-offs. The essence of strategy is deciding what not to do. 3) Operational effectiveness is not a strategy. It is necessary, but not sufficient. There is a dangerous notion that in a world of rapid change, strategy is no longer necessary. This, Porter calls “ridiculous” and “a deeply flawed view of competition.” While strategies may need to be updated more frequently, without a clear direction, no company can succeed for long. Customers have choices. To succeed, companies must have what I call a “winning proposition”, a compelling reason why customers should choose their offering over their competitors. Amazon provides a striking example: “We make it easy for people to buy things by offering a wide range of products at great prices with fast delivery.” This statement not only explains the benefit to the customer, it tells employees what (and what not) to concentrate on every hour of every day to enhance that benefit. In the mid-90s the United States Army War College introduced a new acronym to describe the confusing world order left behind in the wake of the Cold War: VUCA. Today the business world, no less than the military one, is beset by the same forces of Volatility, Uncertainty, Complexity and Ambiguity. It is the responsibility of leaders to create clarity from a bewildering world. Effective leadership is impossible without the ability to distill an organization’s challenges and its strategic focus. No organization’s strategy should be longer than 10 pages. Boiling it down in this way is in itself an exercise in clarity of thought which can then be shared by the entire organization. 1) Why should customers choose to do business with us? 2) Why should investors choose to give us their money? 3) Why should employees choose to work for us? 4) Why should communities welcome us in their midst? By laying out these simple, yet profound questions, Palmisano forced his executives to address the needs of all the company’s key stakeholders and to understand how they fit together. The final deliverable of a strategy is not simply a document. People don’t follow documents, they follow leaders and ideas. Of course, it is important to record your strategy for easy reference, but that is only where the main task begins. The ultimate aim of leadership is to win the hearts and minds of your employees in support of your strategy. Howard Gardner, the developmental psychologist, in an interview in Strategy + Business, emphasized the importance of story-telling as a way to engage and motivate employees. “People have a real thirst for stories that give them a better sense of how they belong” he said. He emphasized that effective leadership involves the creation of powerful narratives, and that the greater the change you aim to make, the more important the story becomes. 3M has embraced this concept by transforming business planning from a list of bullet points into a narrative that not only tells everyone what the goals are, but also how to reach them. Stories arise from our universal search for causes and effects, for purposes and ideals. Stories create meaning. Increasingly, this desire for meaning and authenticity is being subjugated to the deadening dominance of PowerPoint presentations. These five ideas convey an overriding truth. In our world of escalating change, the core principles of strategy have not only remained the same; they are now more important than ever for creating enduring success.